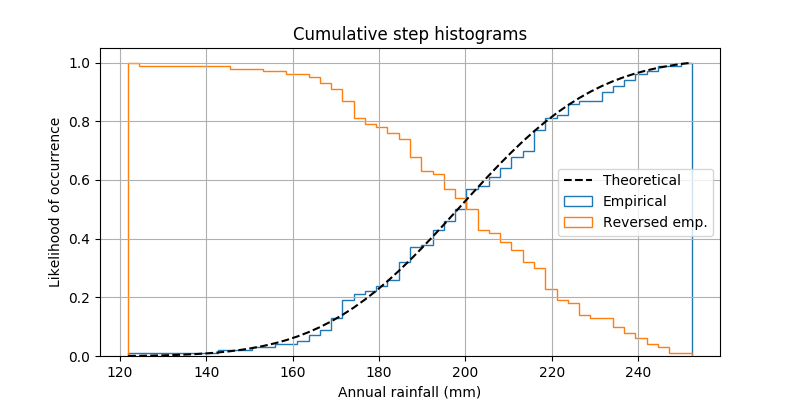 This shows how to plot a cumulative, normalized histogram as a step function in order to visualize the empirical cumulative distribution function (CDF) of a sample. We also use the mlab module to show the theoretical CDF. A couple of other options to the hist function are demonstrated. Namely, we use the normed parameter to normalize the histogram and a couple of different options to the cumulative parameter. The normed parameter takes a boolean value. When True, the bin heights are scaled such that the total area of the histogram is 1. The cumulative kwarg is a little more nuanced. Like normed, you can pass it True or False, but you can also pass it -1 to reverse the distribution. Since we’re showing a normalized and cumulative histogram, these curves are effectively the cumulative distribution functions (CDFs) of the samples. In engineering, empirical CDFs are sometimes called “non-exceedance” curves. In other words, you can look at the y-value for a given-x-value to get the probability of and observation from the sample not exceeding that x-value. For example, the value of 225 on the x-axis corresponds to about 0.85 on the y-axis, so there’s an 85% chance that an observation in the sample does not exceed 225. Conversely, setting, cumulative to -1 as is done in the last series for this example, creates a “exceedance” curve.